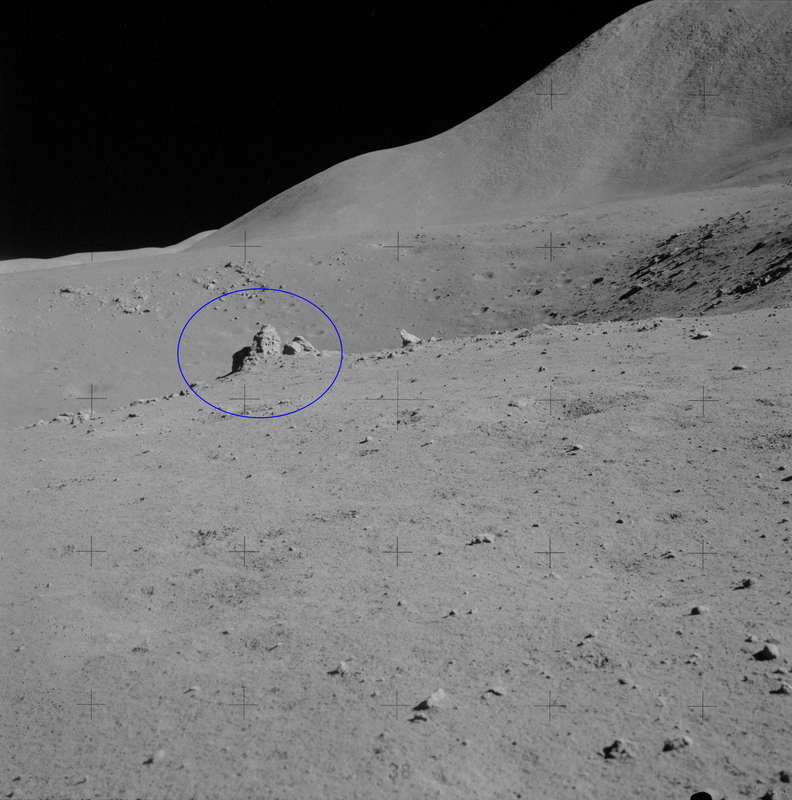 This photo, AS17-140-21370, from Apollo 17 has been staring at me from my secondary monitor for about three days now. I was interested in the SEP pallet shown in it. Well, today I happened to glance over at it, and what do I see but a crude masking over of an artificial light reflection. First off this photo is an impossibility without artificial light filling in the side of the LEM being photographed. 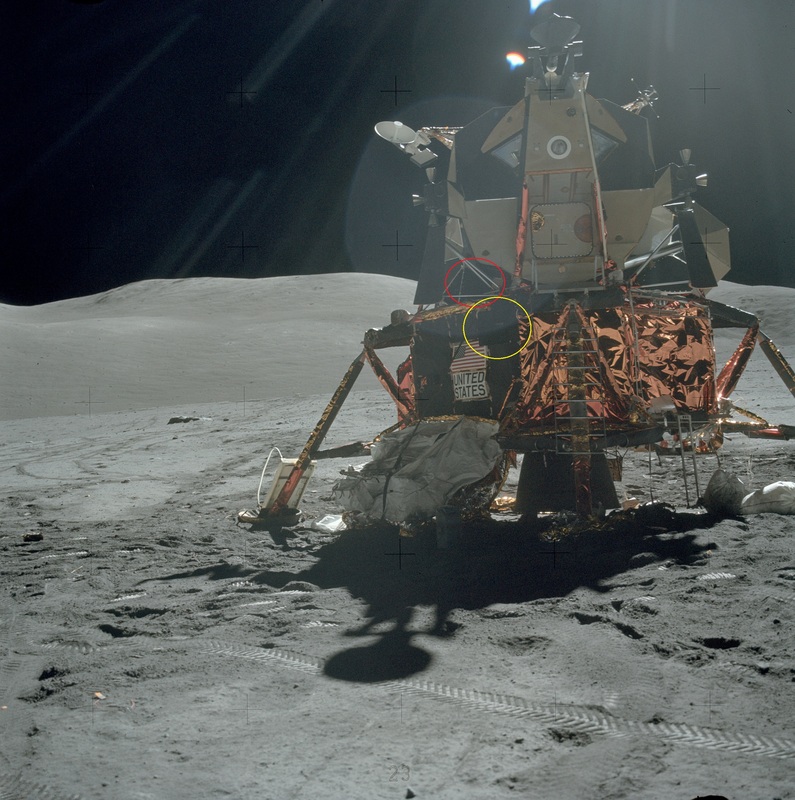 Next, there are several reflections of the artificial light on the LEM, the red circle highlighting the most glaring. There must have been a bad reflection on the LEM, yellow circle, that had to be covered over. NASA covered it over alright. Covered it over with what seems to be a postage stamp shaped piece of tape. 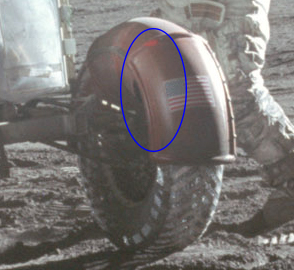 So crudely done was it that it revealingly covered over part of the flag decal on the side of the LEM. omaxsteve wrote: Would love to know how the tires in the moon rover managed to stay inflated for the duration of the trip to the moon. "The rule of thumb is for every 10° Fahrenheit change in air temperature, tire pressures will change about 2% (up with higher temperatures and down with lower). This means that light-duty, standard-pressure tires (typically inflated to 30-50 psi) used in applications on cars, vans and light trucks will change by about 1 psi; where heavy-duty, high-pressure tires (typically inflated to 80-100 psi) used in applications on recreational vehicles, busses and trucks will change by about 2 psi. " 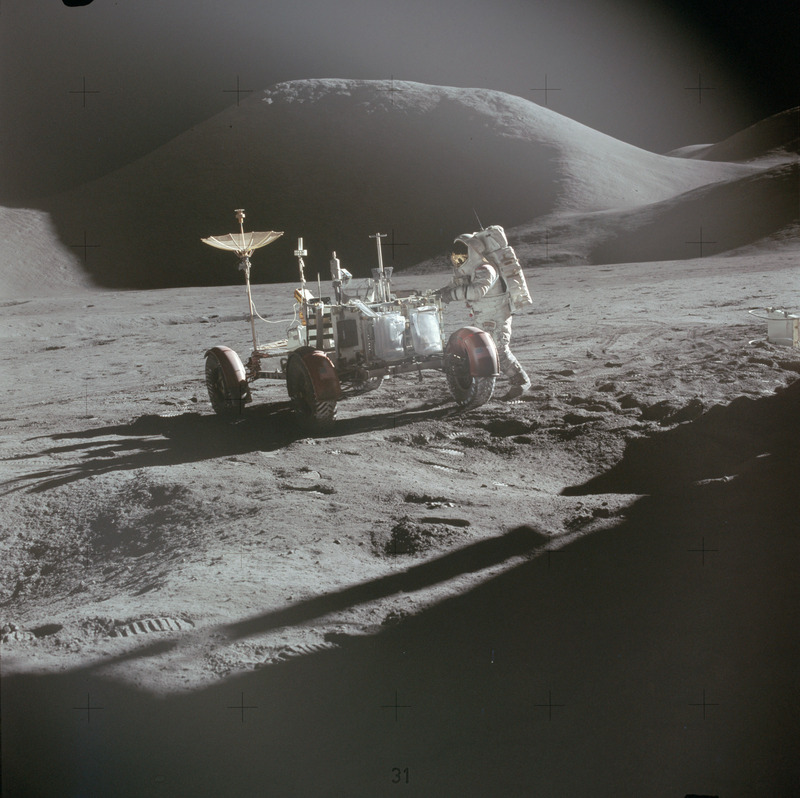 Ergo the extreme fluctuations in ambient temperature on the surface of the moon should make the moon buggy tires pretty much undrivable.... or am I missing something? I thought the official story was that they never used inflatable tires. The wheels were supposed to have been unfolded empty things that don't contain gas. 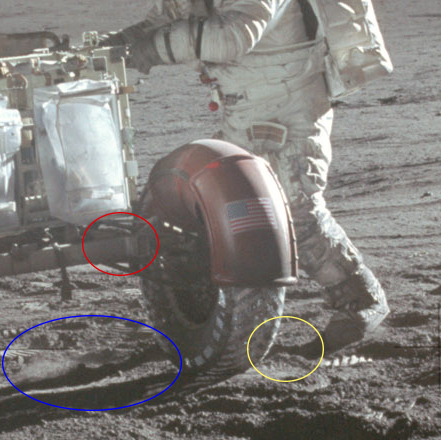 Were there actually supposed to be traditional rubber tires on the moon? hoi.polloi wrote: I thought the official story was that they never used inflatable tires. The wheels were supposed to have been unfolded empty things that don't contain gas. Were there actually supposed to be traditional rubber tires on the moon? "The mesh was woven out of piano wire to provide a soft, springy surface to contour to the ground and provide good ride quality." 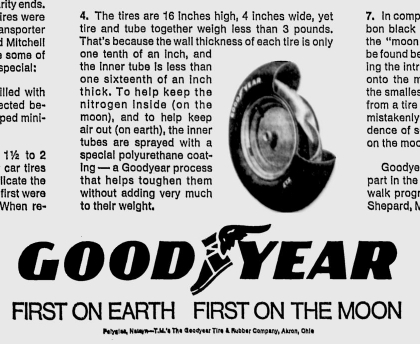 Now, a good question you might ask yourself is: why the heck would they ask the "Good Year" tire company to develop something which has NOTHING / ZILCH to do with rubber-tire technology? Wouldn't they have rather asked, say, the Steinway piano manufacturers to develop that "piano-wire" moon tire? "Some down-to-Earth facts about the first tires on the Moon"
As ever - here we have another tall Apollo tale that make no sense whatsoever. What a bunch of 'rubber-faced-wire-balancing' circus clowns. Yesterday was the memorial at Arlington National Cemetery for my cousin Bobby Moon who died in a plane crash in 1952. The plane was buried in the snow and only found this year because melted snow on the mountain revealed the plane and its remains. Our family can now put our Bobby to rest. Great find. I too remember in the 70s them making a big deal out of the tires that the rover used. The metal ones now being shown were NOT what I was shown or told of in the 70s. Something about these photos, AS15-90-12242 & 12243, bothered me for quite some time before I finally saw it. The line of rocks at about the middle of each photo is the edge of .5 Km wide Dune Crater. Interestingly, the prominent thumb shaped rock at near center is casting a shadow that falls on nothing, but is still visible, as if a hologram. 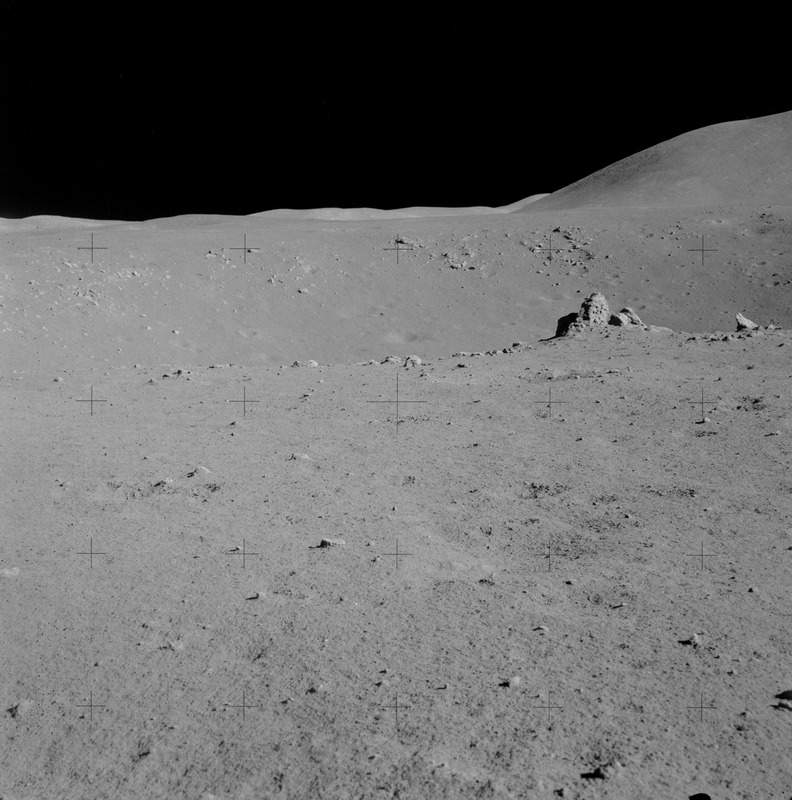 There is nothing behind the rock for the shadow to fall upon, and the other side of the crater is at least .5 Km away. In zoomed version of 12243, in the blue circle, one can even see parts of the background, Dune Crater, visible within thumb rock's shadow. There's more wrong with this series of photos, but I'll leave that for another post. "NASA! You got some splainin to do!" AS15-90-12242 & 12243 again, and AS15-87-11779. 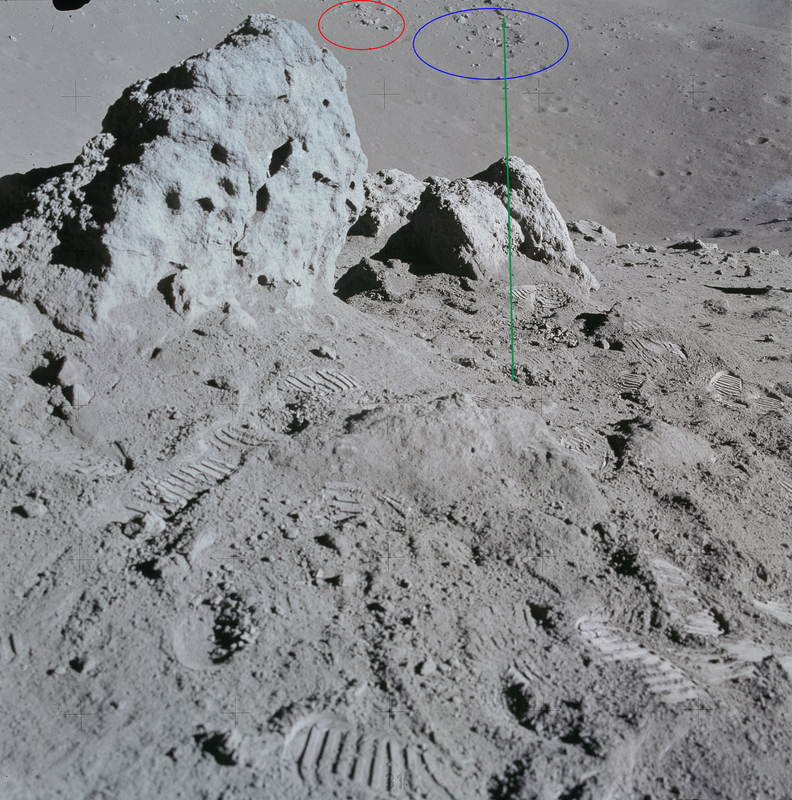 Note the two small craters in 12243 along the green line--I call those two the "Snowman." In 12243 Snowman is nearly straight behind the thumb rock and its bogus shadow. 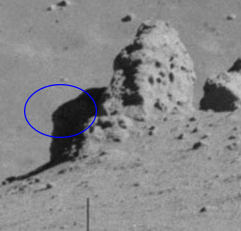 If the viewer could walk into the photo and then straight to thumb rock, Snowman would stay in its approximate position in relation to thumb rock, but closer. That brings us to 11779. The photog has walked up to thumb rock, and is facing nearly the same exact spot on thumb rock as in 12243. Strangely, the scene has been tilted back to the right by about 10 to 15 degrees. See that now Snowman is several degrees to the right of where he was in relation to Snowman in 12243. Now note the formation just below the hole mark in the upper left of 11779--the two rocks with a small crater below the middle of the span between them, and just to the left of thumb rock. The same formation is seen in 12242 (outlined with green lines), but is found many degrees to the left of thumb rock in 12242. The only conclusion is that the background has been rotated to the right many degrees between the taking of 12242 & 43, and 11779. Sorry, but I'm not sure if you're 'splaining this plainly enough. It seems you are just circling things and saying they are inaccurate and diluting the discussion with too many words without clear and concise explanation. Have you actually had positive responses to your "explanations" somewhere? Like on your own site? Links to the portion of the December, 1966, National Geographic article mentioning that four years prior a laser was bounced off the Moon and its return measured. 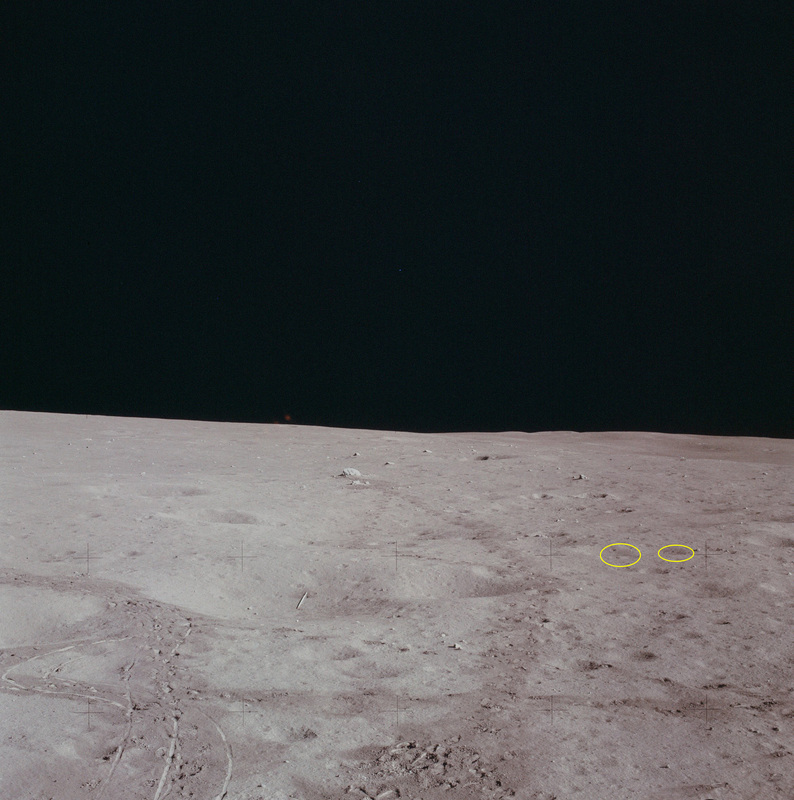 AS15-86-11603 (11603) is, as far as I have found, the Apollo scam photo with the most errors--a hodgepodge of errors. 11603 also contains clear evidence of tampering to coverup a revealing mistake. In the following zoom I highlight just a few of the strange and inconsistent shadows in 11603. 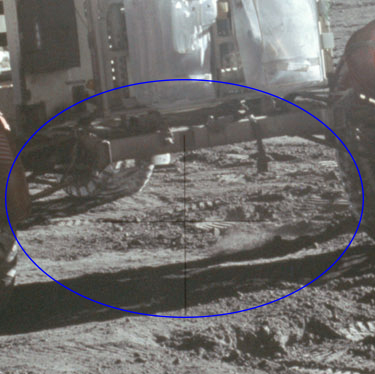 The blue circle shows the "not's right leg shadow converging in the space of about 1 meter with the tire's shadow. They should not converge at all. The yellow circle highlights the "not's left leg shadow falling up and to the left instead of down and to the left as it should. The red circle shows the reflection of the artificial light source used to fill in the scene. More about that later. The following zoom shows what many others have said of 11603: It is a good example of the use of fill lighting to get an effect that would be imposable if the sun were the only source of light. In the red circles the "not's suit is well lit in the front. This is impossible if the sun, as indicated, is on his back. 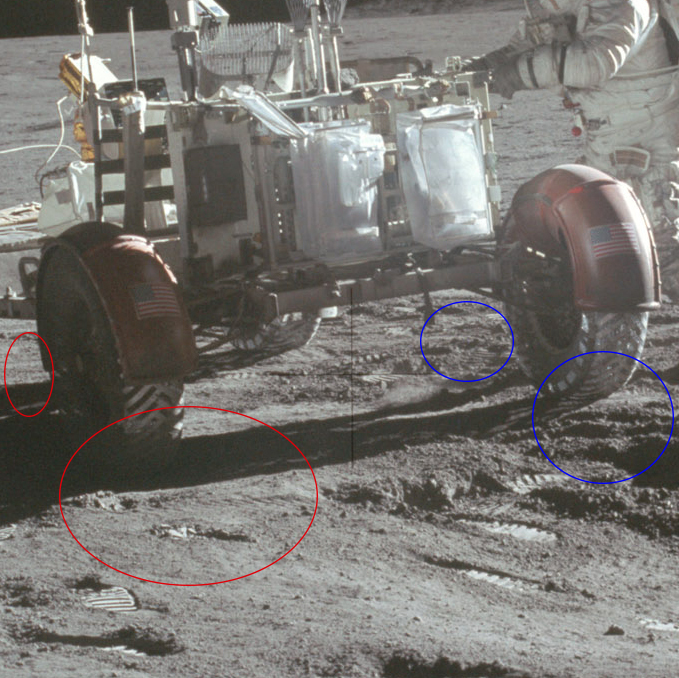 The blue circles are over the rover's port wheels. Those wheels are are on the non sun lit side, and in shadow. They should be nearly lost in blackness, but are instead illuminated enough that some of their details are discernible. More evidence of the fill light used to illuminate this scenes is shown in the image below. Notice in the blue circle two reflections of the fill light used to illuminate this scene. Both reflections face upward and toward the left of the camera. 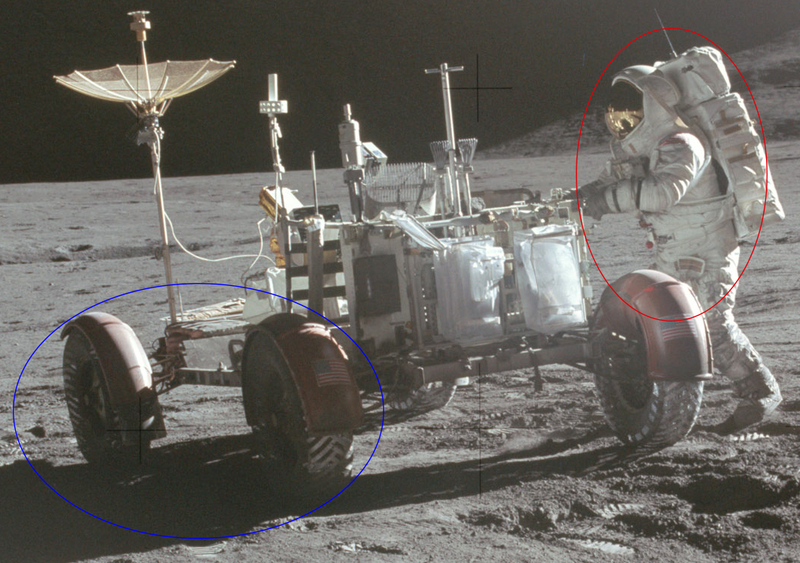 Neither reflection in the blue circle can be reflected surface light, or light reflected from the bags on the back of the rover. Now things take an interesting turn, as the rover's bed/frame is not casting a shadow consistent with others shadows in 11603. There should be a shadow of the rover's bed underneath of it. There is not, as can be seen in 11603, and in the blue circle of the zoom below. Seems that the shadow of the SEP pallet to the center right of 11603 took a command from Shakespeare's Macbeth, "Come like shadows, so depart!," and departed. Of note is just the pure lack of a shadow from the SEP pallet, and the impossible light falling on the bar in the yellow circle. Notice that the that the blue circled mound of soil does cast a shadow. It should instead be engulfed in the SEP pallet's shadow. Just redonkulous. And now the tampering bit of the presentation. If one accepts that a fill light is being used in 11603, and that it is to the right rear of the camera, then one would expect that light to be reflected in the "not's visor. Why is it not? Zooming in provides an answer: 11603 has had a crude masking applied over the 'not's visor. Below, the red arrow points to the right angle of the masking on the right of the 'not's helmet and visor. Notice how the masking covers over part of the right side rim of the 'not's helmet. With further zoom, a right angled corner formed by the masking is visible out away from the helmet, and against the background. 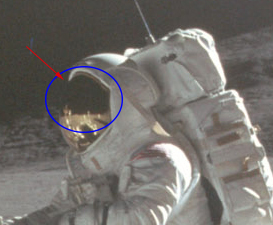 In addition to the right angle formed by the masking on the 'not's right (red arrow), an edge running along the top of the masking is visible against the top of the visor (yellow arrow), and another right angle is seen on the left of the visor (green arrow). My Photoshop skills are limited, so get a copy of 11603 from NASA yourself, and then zoom in for a better look at the masking over the visor. Sorry, I am really not trying to troll your results, but I think some of your points are off. The shadow that you say should be under the carriage is "cast" to the left. Why do you insist it should also be immediately under the moon buggy prop? 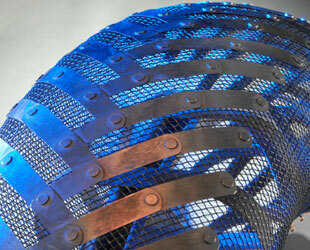 Light reflects adequately from a surface to illuminate some things that are not in direct sunlight. Not as much as the wheel guards on the right, which are far too bright, but the ones on the left just might. By saying they are inconsistent you would be making a better point. By saying they are both impossible in separate cases confuses the points, no? 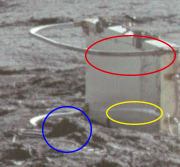 I am not sure you have convincingly demonstrated that the texture you say (here, two posts back) is too far away in the second picture, is in fact all that different between your selected NASA images. You've simply chosen one image where the foreground rock divides the image plane. We know it's studio lighting and touched up, and the evidence for that is everywhere, and we can also be sure something like an early greenscreen tech like rear light projection or Kubrick's 2001 reflective screens may be being used. What you are doing is making too many poor points, without correcting them or explaining them, mixed in with your good points. I think you should stick to your strongest points so it doesn't appear as if you enjoy confusing people and/or setting up straw men. If you don't start answering these questions, what are we to assume you are here to do? I have 'colorized' the portion you were writing about, and rotated and scaled it to roughly the area you say is so different. As you can see, it's not as different as you make it sound. And, plainly, it is not very much that the "distance" is wrong between the formations you point out. Instead, it's mostly the rotation and skewing of the formations, which is meant to be consistent with the tilt of the camera. ... then, there would be less reason to move individual formations (as you allege and have failed to demonstrate) and it's more likely skewing would be from either the first step (changing physical position of the camera while capturing the scouted location that will later be projected) or the second step (distortions on the projection screens caused by the projection process or screen movement) since the third step (manually moving/skewing elements in a photo lab) is probably going to be the most laborious for intelligence professionals to make consistent. We do not know their technique, we do not know how much was military "volunteer" and how much must have been paid to the workers to motivate them, but my argument is consistent with my point against your allegation. They would want to make the process as simply and cheaply for themselves as possible. Clicking buttons on cameras and mechanisms already invented for Hollywood (e.g. ; the Hasselblad cameras), and then at best sending them to the Laurel Canyon nuclear animation studio for touch up, is probably less laborious and painstaking than trying to completely fudge everything in a lab. Nowadays, things are easier for them. They have Photoshop, cheap 3D computer animation, augmented reality, environment simulation and a public media supersaturated with inconsistent messages in conjunction with all the old techniques. But let's try to keep it real on when each technique is used where. Found the following today as I continued my background study work. From Apollo 14 comes AS14-66-9337. Upon closer inspection of 9337 one can see in several spots horizontal lines where the photo was altered in some way. At these lines the terrain and/or disturbances in the sand change abruptly. Below is 9337 with the most prominent of the alteration lines circled. 9337 with the alteration line isolated and highlighted with a line above it. Note the prominent line across the yellow circle, and the abrupt change in the terrain's appearance between the top and bottom of the line. The reader should peruse 9337 further, as there are additional alteration lines like this in other places within, but these were the two most prominent. "NASA! You have some splainin to do!" Excuse me, but I believe you are taking the principles of how they constructed these images and stretching a blanket of confusion over the ideas with some poor arguments. What you said is your "personal motto", "Read, think, repeat", does not seem to be in effect, right now. Or is it some kind of military "strategies in deflection" handbook you're repeating from? Why would NASA paint a shadow here, where you claim they should? I am not defending the images as real, but you have blatantly ignored two requests to explain why you have put really bad arguments in your entries that otherwise would serve to help people explain construction methods, and refused to respond to simple questions for explanation. This is the third time I am asking you to respond to perfectly valid questions as if you were on a forum and not a personal blog service. If you ignore this request, you are essentially telling us you don't care that your arguments are bad and you'd very much like to dilute this important topic with garbage. There isn't much we can do with someone like that, and if you care to waste everyone's time, your posts and your membership will basically be subject to removal. You did not respond to my question about your military background in the introduction thread. You are not seeming very willing to 'splain your own self. Now, how again did you find this forum?